If you like this informative newsletter, please do a friend, and us, a big favor by "paying it forward." Do you know someone who is planning a baby shower? Or, someone who's looking for awesome baby shower gift ideas? Or ... just great Holiday deals! Unique-BabyShower-Gifts.com Has A New Store Front! Brrrr! ... It's getting cold outside and with that northern gust of cool Winter air comes ... Yes! The Holiday Season. We have lots to share with you this month in our newsletter as we've been out prowling around again finding not only terrific deals on baby shower gifts and planning ideas, but just about anything you could wish for on your holiday list. So, grab a cup of coffee or tea and get ready to start crossing off your naughty and nice list ;), because we've included some awesome deals! Be sure to take a peek at What's New! We're all loaded up for the Holidays and all sorts of ideas for Holiday planning for a Christmas Baby Shower. Including Christmas Baby Shower Invitations, Favors, Decorations and much more! Get your festive creativity flowing to plan a perfect holiday baby shower with your family and friends! But, first things first ... yes, our free baby shower invitation of the month. So, if you're planning a baby shower to throw around the Christmas Holidays, you're going to love this months pick! ... It's all about early planning for a Christmas Baby Shower ... and ... that new adorable "Santa Baby"! Of course, every Celebration starts with an invitation. And we have a very cute one this month! Our "Santa Baby" Shower Invitation is perfect for a baby boy or a baby girl shower and it's designed right from one of our new baby shower invites at our new SaccoBambino at Zazzle.com! Pretty handy if you want to order some stickers, favor mugs and bags ... or our fabulous apparel gifts for Mom-To-Be and Baby! Simply download and print ... it's easy! We know you will enjoy using these awesome invitations as much as we enjoyed making them. So convenient to print and great to hand out to family, friends and co-workers! The "Count Down" continues ... can you believe the Holidays are so close? Where did the time go?! Remember last year and how crowded it was at the mall? Well, we have a plan ... we'll tell you our secret so for next year you'll be up-to-date! Yes, it's such a great feeling and we're just about done ...WHEW! Check our reminder found at Baby Holidays Gift Ideas ... and keep up with your monthly gift purchases ... get ready for Black Friday and onto the deals I was telling you about. Whether you're looking for baby shower supplies or just shopping for the Holidays, you're sure to find lots or great bargains! Have you ordered your Christmas cards yet, or your Baby Shower Christmas invitations? ... That is, if you're not using ours ;) Get 20%-30% Off when you shop now! More Great Savings On Favors and Gifts! Awesome Baby Shower favors, decorations, gifts and supplies ... but also find great savings on those little "knick knack" gifts for anyone ... and you can even have most of them personalized! More Adorable Christmas Ornaments ... Don't Forget Baby's First Christmas Ornament! Wayfair Has A Zillion Things! Stumped?! Don't know what to get? 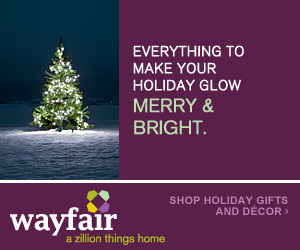 Check out Wayfair's Christmas Gift Guide and find just the perfect gift! And Perfect For Your Holiday Party! We found these really cute printable baby shower games, from Baby Shower Games A To Z. Pay one low price and print as many as you want! And right now get 10% off your entire order! Add some excitement to your Holiday Party, or incorporate these fun games into your Christmas Baby Shower! Making Your Own Holiday Or Baby Shower Invitations Or Decorations? See "What’s New" at the Invitation Gallery at Two Peas in a Bucket. And also check out Kristina's Picks for more ideas and watch their "Walk Through The Warehouse Video" to find out what's new! Need Something More Elegant For Baby Shower Favors and Decorations? Visit Serendipity if you're having a more upscale Holiday Baby Shower, or just looking for a small Christmas gift. From frames to elegant candles, even great ideas for small gifts for your co-workers! And remember, Wedding Favors make excellent Baby Shower Favors ... just change the personalization wording! Great Gifts That Are "Uncommonly Good? Visit UncommonGoods.com for unusual and adorable Holiday gifts or baby shower gifts. Check out our review page and find out more about unique baby gifts that moms love! Baby's First Book Is Now On Kindle! Everyone knows that reading aloud to your newborn makes for a brighter and well balanced child. Now, let's take this a step further and imagine reading aloud to your baby every day with the new Kindle! The words seem to come alive as graphics dance across the screen. More and more, researchers are finding that children learn better when Visually stimulated. Read More About Kindle On Our Website! Looking For Great Discounts On Sacco Bambino Products?